What’s the most common migrant butterfly to arrive in the British Isles? What’s that white butterfly with orange wingtips? 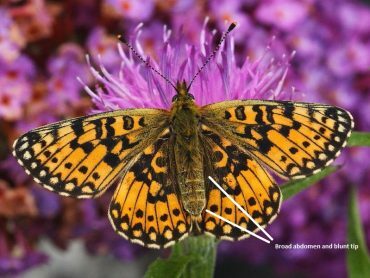 What’s the difference between Pearl-bordered Fritillary and Small Pearl-bordered Fritillary butterflies? Numbers of migrant butterflies appear to be generally low for this time of year in Cornwall. This Painted Lady came to our garden last week and was in pretty good condition.